Spider Veins showing on the skin surface of the legs can be a sign of a more serious health issue besides visible impression or cosmetic concern. What are Telangiectasia?Are these spider veins? Telangiectasia or spider veins are red broken capillaries that can be found in the face, arms, back, or chest. However, when it comes to the legs, spider veins can be a concern related to health issue called venous insufficiency. This is the reason why it is important to know the cause, diagnosis, and treatment of spider veins. Some of the common causes of lower extremity spider veins are genetics, medication that dilate blood vessels, multiple pregnancy, excessive alcohol drinking, trauma, surgeries, and prolonged standing. Age can be a factor as well. 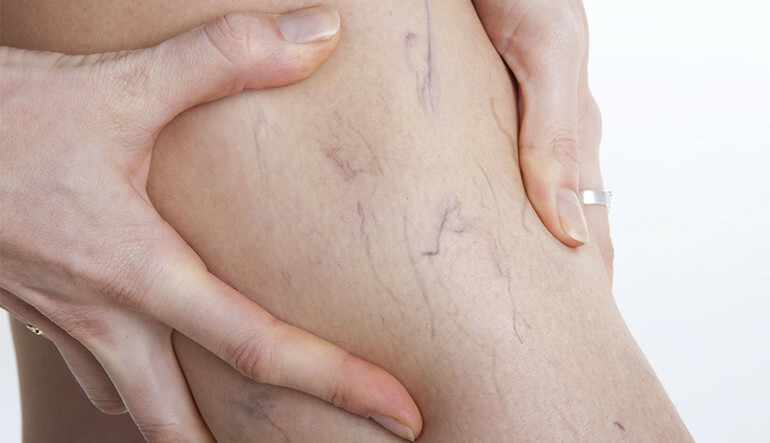 As we get older, blood vessel valves can weaken causing the appearance of spider veins. During pregnancy, as abdomen increases in size, pressure in the venous system of the legs also increases, causing the appearance of spider veins and varicose veins. Weakening of the valves can be irreversible leading to venous reflux. Venous reflux is a treatable condition and as technology advances, treatments are done by minimally access with great outcomes. Sclerotherapy is a minimally invasive technique where a chemical solution is injected into the spider vein or varicose vein so they harden and ultimately disappear. This procedure should be always performed by a certified provider. Advanced Sclerotherapy is one of the treatments that Dr. Michael Nguyen performs in the Vein Treatment Center in New York. Ultrasound is used as a tool in the procedure to guide vein specialist to target the specific source that needs care and sometimes cannot be seen properly without ultrasound. The same treatment is also used to treat spider veins in the surface of the skin as well as varicose veins that can sometimes be seen very easily. Always consider an expert advise when it comes to any of the treatments related to the venous circulation to prevent complications now and for the future. A vein specialist does the sclerotherapy procedure in the surface of the skin and individually injects with precision each spider vein. Sometimes more than one session is necessary depending on the case. Once first session is completed, proper healing is necessary before treating again and this healing process usually takes 4 to 6 weeks. Compression stockings are prescribed for a week after each session. It is important for the patient to follow post procedure instructions and follow up care. Patients can go back to their regular life after sclerotherapy procedure. Areas that were treated should be covered from the sun for 3 to 4 weeks after injections to help normal skin healing. Area of injections should be cleaned gently and antibiotic ointment should be used in affected areas if there is any sign of scabbing or blister. For the skin areas, specialist can prescribe antibiotic cream, but over the counter option can also be used. After the treatment medical compression stockings will be prescribed with a pressure of 20 to 30 mmHg for one week after. Medical compression stockings need to be on for a week after the treatment for days hours. However, this approach is also used and recommended by vein specialists to manage pain and uncomfortable symptoms that veins and reflux causes. There are different types of compression stocking that go above the knee to the thigh and others that go up only to the knee. Take in consideration that treating spider veins alone might not be the only solution. If there is presence of underlying venous disease, new spider veins can form again. Vein specialist can recommend treatments for underlying condition and this way prevent future spider veins to show up, as well as prevent symptoms and future complications. Spider veins and varicose veins in the legs are common signs and symptoms of an underlying disease called venous reflux. Signs and symptoms of venous reflux include leg swelling, leg fatigue or heaviness, leg pain, leg night cramps, skin itching or burning, and leg ulcers or sores. The way venous blood flow normally moves towards the heart through unidirectional vein valves help the blood to keep moving up. When valves are not working properly, blood starts to pull in the legs causing signs and symptoms like those mentioned above. Factors that contribute to the vein valves failure include age, gender, family history, weightlifting, multiple pregnancies, and prolonged standing. Seeing an expert in venous circulation should be the first step to consider when you want to treat spider veins, varicose veins, venous disease, and/ or related issues.